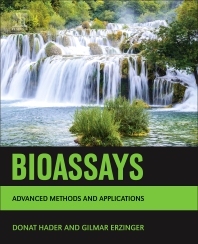 Bioassays: Advanced Methods and Applications provides a thorough understanding of the applications of bioassays in monitoring toxicity in aquatic ecosystems. It reviews the newest tests and applications in discovering compounds and toxins in the environment, covering all suitable organisms, from bacteria, to microorganisms, to higher plants, including invertebrates and vertebrates. By learning about newer tests, water pollution control testing can be less time and labor consuming, and less expensive. This book will be helpful for anyone working in aquatic environments or those who need an introduction to ecotoxicology or bioassays, from investigators, to technicians and students. Dr. Hader was the Director of the Botanical Institute, held the chair of Ecophysiology of Plants at the Friedrich-Alexander University, Erlangen-Nürnberg, Germany and was the director of the Botanical Garden. He is author of over 670 scientific publications, produced 27 books and holds seven national and international patents. He is or has been associate editor and reviewer for numerous international journals and is currently Section Editor of Environmental Toxicology in Frontiers in Environmental Sciences. His research interests are ecophysiology and ecotoxicology of aquatic ecosystems and he is an appointed member of the Environmental Effects Panel of the United Nations on the Effects of ozone depletion and climate change. In addition, he works on space biology and orientation of microorganisms with respect to light and gravity. Prof. Gilmar S. Erzinger has a Ph.D. in Biochemical Pharmaceutical Technology (2000) from the University of Sao Paulo and made a Post Doctorate in Photobiology at Friedrich Alexander Univesitat Erlangen-Nuremberg, Germany (2009). He gives courses in Medicine and Pharmacy, on the Health and Environment Programme at the University of Joinville Region and Program in Biotechnology and Biosciences, UFSC, Brazil. He is working on productivity in Technological Development and Innovative Extension by CNPq, Brazil. He is author of over 35 scientific publications, produced two books and holds seven national and international patents. His research interests are ecotoxicology of aquatic ecosystems and biotechnology processes and is a researcher at the Foundation for Research and Innovation of the State of Santa Catarina, Brasil.